Apr. 1979 Hirakata Research Labo., Ube Industries, Ltd.
Jul. 1999 General Manager of Functional Material Research Dep. Ube Research Lab. Oct. 2003 Directorate of Functional Materials Institute, Ube Research Labo., Ube Industries, Ltd. The photocatalytic effect of titania (titanium dioxide), a type of functional ceramic, was reported in 1972 by Professor Fujishima of Tokyo University and has come to be applied widely to sanitization, deodorization, air cleaning and similar processes. However, in terms of water purification, for which potential demand is high, the conventional photocatalysts, which are coated with titania powder, pose major problems that hinder full-scale application, including the fact that said powder can separate in running water. Although development is underway to resolve these problems, compatibility has not yet been achieved between durability and photocatalytic activity. Since 1983, Toshihiro Ishikawa has been engaged in research on continuous-length ceramic fibers at Ube Industries, Ltd. and Ube Research Laboratory. On the basis of substantial basic research, Mr. Ishikawa succeeded in developing the world's first high-strength titania fiber with a fiber surface composed of titania nanocrystals. A feature of this new titania fiber is how the titania is made to exudate to the fiber's surface and to crystallize through the natural bleed-out phenomenon that occurs in the heat treatment process that creates the precursor by mixing polycarbosilane with a low-molecular-weight additive, forming what will become titania crystals. The structure is slanted, with many titania collecting in the direction of the fiber's surface. The maximum surface is encased by 8nm of titania crystals. These results were published in the March 7, 2002 edition of "Nature," a science magazine. Prior to this, Mr. Ishikawa had already developed a crystalline carbon-silicon fiber able to withstand temperatures of 2000℃ based on the success of basic research on continuous-length fibers using organic silicon polymers and polycarbosilane as starting materials. This development was announced in the February 1998 issue of "Nature" and the November 1998 issue of "Science," an American magazine. Ube Industries has commercialized high-strength titania fiber in the form of a "photocatalytic-fiber modular aqua solution," 27 units of which have already been installed in hot-spring areas ranging from Hokkaido to Kagoshima. Tests using this equipment in a plain alkaline hot spring confirmed epoch-making reduction of Legionella and coli bacteria. Additionally, experiments conducted at Kyoto University Graduate School confirmed that Aoko (blue-green algae) poison was reduced to 10% or less in around two hours. Owing to the equipment's outstanding effectiveness on water contaminated by dioxin or environmental hormones, a major expansion in sales -- on the order of ¥350 billion -- at water treatment plants is expected. The aforementioned crystalline carbon-silicon fiber has earned high marks from space and aviation-related industries domestically and abroad and has already been commercialized. 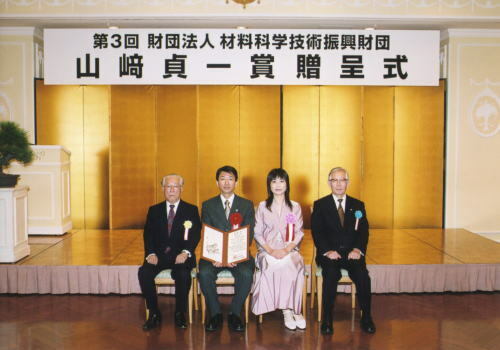 As of August 2002, Mr. Ishikawa's thesis on reactions between organic silicon polymers and organic metal compounds, which was the basis for these commercial achievements, had been cited 116 times; scholastically, as well, his contribution has thus been recognized as extremely large. In addition, rights to 26 major related patents have been sought.